This has been a long long time since i wrote any post regarding anything.I have been super busy with my life and job. But it was worth it in the end i think. Started a new job[not new now] at Progmaatic Developer Network which is a great place to work so far. Also consulting at ICDDR,B as an Android Developer in my weekend to finalize one of the project i did for them more then a year ago. Got interested in Game Development and iOS Development. Currently doing 1 iOS project and 1 unity3d based game. So what will be today’s post is going to be about? Today’s post is going to be about something that i solve pretty recently for my unit3d based game[still on going]. So, let’s get cracking 🙂 . The game i am currently working is a 2d game. For the gameplay i needed to know which way user was swiping, based on that direction my player will move in that direction. Since i am no longer in android or iOS where i can just use the gesture detector classes and get it done so i needed a different way. So how am i going to solve that? Fletcher Dunn and Ian Parberry for their amazing book: “3D Math Primer For Graphics And Game Development”. Out of my own interest i just wanted to read this book to have some knowledge about 3d game development in general so i can have some knowledge about what’s going on underneath. There i got introduced again with some of the techniques about vector mathematics that i long forgot. So to solve the problem i was having i applied the vector mathematics 🙂 . To know the direction of swiping i need to know at least two position and i know can get them via touch/mouse api from unity3d. I think you’ve got the idea of how it’s working. After getting v2delta if we normalize it, we will get the unit vector of v2delta and when you get that just check x and y component of the normalized vector to check swiping status of the user.I have defined the threshold of 0.8 . But it’s really up to you how you want to define the threshold. 1 means perfect swipe. But user hands might not be steady all the time so he/she might slip-away a little bit from perfect swipe. Well this portion of code is applicable anywhere where we might need to calculate swipe event of our own. FYI: This post can also be found in Progmaatic’s Blog . It’s been a long time since i wrote any post.I have been super busy with my projects , i couldn’t manage my time to write any post for my blog. Today i am going talk a little bit about using singleton pattern.And show you an example of it during the explanation. Now what is it? and why do you care about it? First let’s imagine the normal way of doing things if you are novice anough :). Say my application consist of N number of screen.Now all screens uses an object for accessing some kind of data.If i were novice what i would do is create object of that class in every screen to access those data. That would create N number of object. Now since we only need to access some data but not to modify any data of that class object do we really need to create object for that class in every screen. Now let’s get down to what is it?As i said it’s pattern but more likely a design pattern. Since we only need to access some data from a class, what this let’s us do is to create one object for the enitre application life cycle.And we can access those data over and over again using only single instance if that class object. Why do u care? Well, i think it’s obvious, isn’t it? Save memory, Reduce complexity of the application…. Since the contructor is private the only way to get an instance of that class is calling static method getInstance of class A, so now whenever you call A.getInstance() it will return either a new object or an object that already been instantiated. Now let’s see a real exmple that might be helpful to some guys.I made this somedays ago during one of my project and documented it along the way so people who see the code can get a little bit of undertanding, what this class do? * DatabaseHelper.getInstance.executeDMLQuery(dmlQuery);// will return true or false based on the action succeeded    or   not if checked? private static final String CREATE_ANTLER_TABLE = "create table if not exists mytable "
+ "(_id INTEGER PRIMARY KEY autoincrement,"
Log.w(DBTable.class.getName(), "Upgrading database from version "
I hope this help some people as it helped me. Howdy everyone, today i am going to share a little code snippet that i developed recently while i was playing with my usual android development journey. I wanted to build an android file manager,where one can browse all the files from sdcard.To bring up the pace in me at first i wanted to see all the files in sdcard.And this post is about that code snippet. In this post i am going to use ddms too, to help me out what’s going wrong. Above line is the most mandatory one but not everythig even if it seems. After running this we will see a "Force Close" in our emulator. but never fear this is where our solution is reside. you can see it’s a NullPointerException which is causing the problem, that means we are assigning a null reference somewhere in our code. what happens when there is only a directory left at the end of a folder but no files in it. So that means, at that time we are assigning what’s in this below line? Which has no length!!! So, to fix it all we need to do is check to see if the reference is null? See how ddms helped to us to make a way when we can’t figure out things all by ourself. That’s it for today, next i will try to write about Sensor bcz i recently added the Samsung Sensor Simulator in my eclipse, which is awesome. Today i’ve just developed another app for android using android’s own text to speech api. i will provide the source code on request. 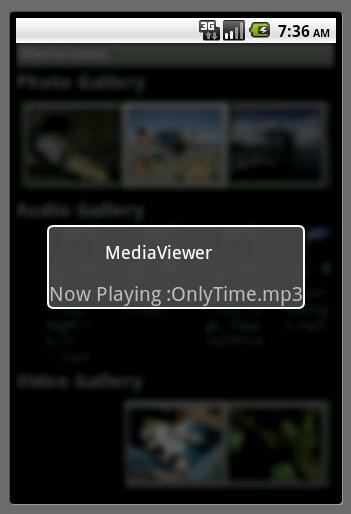 It’s a pretty simple app with a neat interface. I am sure you can guess what this application does. Of course this application only support those languages that android platform supports. blog bcz this application is inspired from his androidsam app idea. Download source code: please contact me. 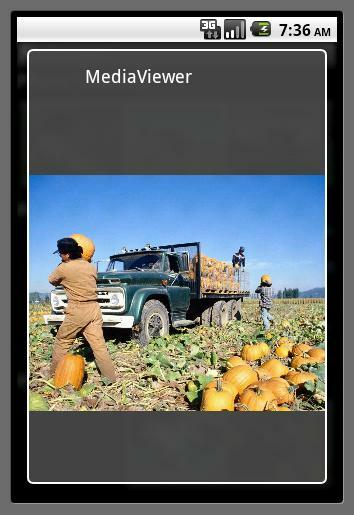 Hello everyone.Today i am going to share my first android app that i built recently. 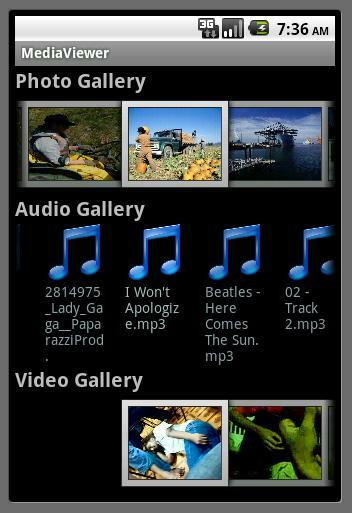 The app is very simple.All it does is seek to see if you have any audio,video or photo in your phone, and represent them nicely in three gallery.One for images,one audios and other is for videos. Here are some of the screen shot that i have taken. You can click on any item and it will pop up another float screen with that item. Oh, there is small button at the end of the screen if you want to contact me. This application will be under development even though I’ve shown to you. There are tons of idea pouring into my head and i will try to implement them, so in a way you can say that this app is the 1.0 version of MediaViewer.I will not publish it’s source code now since it has lot of things to update.When the update is done i will provide the source code.Till then if you want to test the app for yourself please contact me. If you have any query about anything please do comment.I’d be delighted to know. Hello everyone, it’s been a while since my last post.It’s bcz i’ve been too lazy last few weeks figuring out what to do or what not.Though it’s not bcz of me it’s bcz my last semester exam is nearby and i have so much to do and so much to learn,Do you know the feeling when you are too excited to do lot more than you are thinking and you can not do anything at all, well i am in that situation right now.Let’s hope nothing goes wrong. So, today i am going talk about android gps. I am not going to dig into the theory behind android gps,rather i will try to show how you can begin development with android gps. At first download this simple project so that you can understand what am i mockering. There may be different types of location services available in your device, to access those service we need a manager LocationManager. In this portion of the code We are getting the handle of LOCATION_SERVICE to manager, that is LocationManager. Now that, we have the handler, we try to see current location by GPS service of that device,(you can also access other services using other providers (only if that’s available on your device)). Since we have the GPS_PROVIDER, now all we have to do is calling some method to see what gps is providing for us.Here we are trying to get the last known location. This portion of the project is most important for us since it is responsible for listening the changes made by the device’s gps. minDistance, android.location.LocationListener listener) which takes as you can guess, 4 parameter.which provider to use,minimum time before listening for changes, minimum change in distance , and the listener. here we have 4 methods but what we need for this project is onLocationChanged(Location location) and onProviderDisabled(String provider). Every-time device changes it’s location, listener will fire the onLocationChanged(Location location) method with providing the location. now remain only is updateWithNewLocation(location) which tells our UI to update with the location. Before you run this project you should do a simple modification in your manifest file. add <uses-permission android:name=”android.permission.ACCESS_FINE_LOCATION”/> in your manifest. Use android.permission.ACCESS_COARSE_LOCATION if you are going to use LocationManager.NETWORK_PROVIDER. And that’s it,wait, don’t run it right-away, we have a little housework to do.Now the Q is how the heck emulator is going to fetch the location, well that’s when mock gps comes in. It will mock you with gps location 🙂 , well not you, i mean emulator. Fire up your emulator, after loading the emulator open your eclipse ide and go to ddms perspective view, you can see lot’s of thing happening in here. Find the emulator control. now, i have provided a kml file with this project which stores some places location with their latitude and longitude.from emulator control’s kml “load KML” and locate the kml file. In my previous tutorial I have talked a little bit about intent. So we have our intention to do something either explicitly or implicitly now it’s time to start those intent. And we do this via startActivity() or startActivityForResult() but why do we have two kind of method for this. As name suggest startAcitvity will only take you there where you wanna go without worrying about getting any result from child activity to parent activity. It’s real classic when you have a sequence activity to go through, like filling some information in every activity and that’s it. What if you want an activity that uses information from other activity or may be other application. In that case you need more than just startActivity(). And that’s when comes startAcitvityForResult(). So it start another activity from your activity and it expect to get some data from child activity and return that to parent activity. Now we will try to understand startAcitvityForResult(). using previous ContactPicker example. now that need to be done bcz you don’t actually know which sub activity is going to give you the result(if you are using implicit intent) so we need to somehow differentiate between sub activities so that we can take different type of action for different type of result. startActivityForResult() accept two parameters as it’s arguments, one is going to be the explicit or implicit intent and another is called request code which is our static variable. now whenever subactivity finishes, it will return the request code you have sent, along with the data and a result code to your main activity. In the subactivity side subactivity will finish itself and return the data to the parent whenever it gets the chance to execute the below code. Here Activity.RESULT_OK is the result code we were talking about. Now if something goes wrong with subactivity Activity.RESULT_CANCEL will return. You should also remember that when we have created an intent in our main activity we defined our action as Intent.ACTION_PICK. And of course ContactPicker has an action named android.intent.action.PICK. And also the kind of data we are looking. Android will use something called Intent Resolution to find a best fit activity and that is in our case is ContactPicker activity.So voila, startActivityForResult() will open up ur subactivity. After choosing a contact it will return to the main activity by setting the result setResult(Activity.RESULT_OK,outData) and finishing off the subactivity. Thanks for stopping by. My name is Saiful. I have completed my graduation in Computer Science & Engineering from Shahjalal University of Science & Technology(SUST) and recently have joined as a Software Engineer at Sentinel Solutions Ltd.